Doesn't really matter what it was - in as much as what it was that wasn't working would not add humor, irony or depth to this pöst. A quick query to the Giant (Search) Engine that Did (not to be confused with the Little Engine that "Wood") and lo a behold the pop-up action for error code 0x800 was an eyeful (but not to be confused with an eyeful tower). Yes the power of PageRank is great - but who knew this meant that all this information being cataloged included error codes. 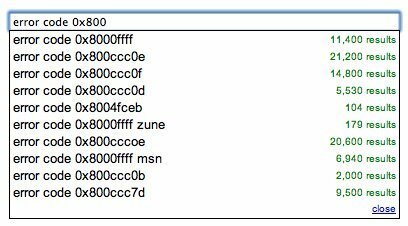 Clearly 0x8004FCEB is the least popular of this bunch. Now unfortunately this doesn't quite untangle the popularity by frequency of occurence from the frequency of linkage. p.s. (not to be confused with .ps) For the Bold Lentil reader that recently used a stamp to initiate a "reopening" be advised that said figure of $250,000 is, at best, speculative. We do however accept that this is a blög and not a blog. Likewise this is a pöst and not a post. p.p.s(not to be confused with PPS) Pinglewood has posted Chew Lips demo of Solo.